One of my favourite memories of meeting locals when I travel is of two gentlemen I met in the Latvian port town of Ventspils. We only chatted for five or ten minutes, but I’ve always remembered them, and as it was something that happened fairly early on in my travelling years, it’s an incident that often reminds me to take the chances to get to know locals wherever I can. That’s one of the reasons I love this new episode of The Thoughtful Travel Podcast. Each of my guests has been very intentional about getting to know local people in a positive and thoughtful way, and great stories have resulted – enjoy! Easily one of my favourite and most rewarding things to do when I travel is find the chance to talk to locals. I don’t want to just see the sights: I want to know what it’s like to live there! Especially after living in three different countries to my own (and each quite different from the other), I’m utterly fascinated by local customs, thoughts and ways of life and so Episode 122 is all about talking to locals when you travel. The first guest is Eva Westerling, who recently went on a long trip to Morocco (prompted by this podcast – she heard previous guest Anna Kwiecinska speaking of trekking in Morocco, got in touch, and off they went together!). During this trip, Eva had the chance to get to know her two Moroccan guides really well and she tells us what she learnt from them. Following Eva, we stay in Morocco but chat to Talon Windwalker. 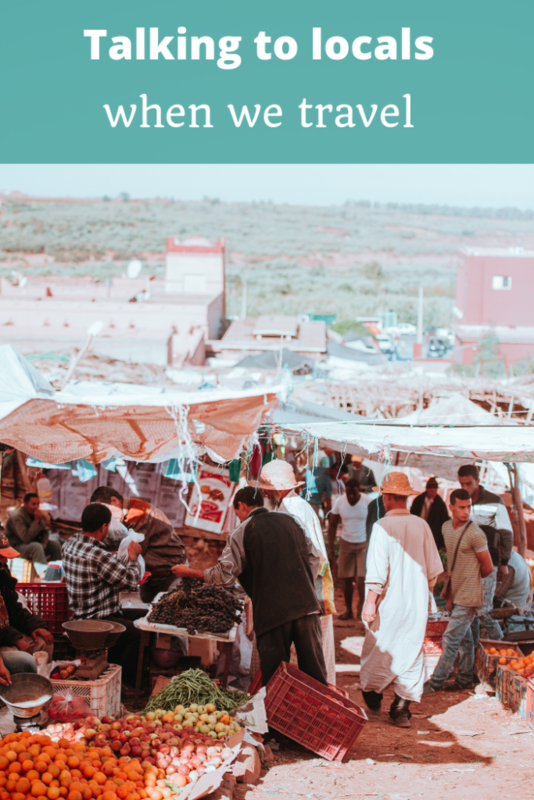 He spent some time housesitting in Morocco and got to know a local very well – to the point where they could have conversations about some really tricky topics, which proved very eye-opening. Finally I chat to Joanne Karcz who discovered the Global Greeter Network when she went to Bilbao a few years back – it sounds like a fantastic way to meet locals, and Joanne is now a greeter herself back in Sydney.